Making the most of our weekends (I think) - Stop staring and start sewing! We're really enjoying our 3 day weekends now that Joey is used to the 10 hour days. We're getting a lot done around here on that extra day and hopefully the house will start shaping up soon. It still feels very discombobulated but I can see a light at the end of the tunnel. I'm working on some cabinets I got at a fun store that recycles building supplies from remodeled houses and businesses. They needed a really good scrub down because I think they're from a restaurant and they had kind of an oily coat on them. I'm using the gloves because I washed them with TSP (because I mean business). Today I had Joey move everything inside for me because the paint was drying too fast in the heat (it's been hovering around 110 for a week, ugh). I'll be back soon with an update. 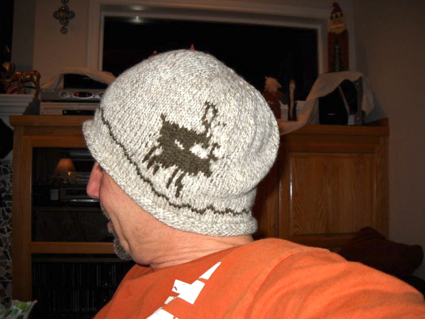 In the meantime, my knitting man has had time to work on a project for himself and is determined to finish soon in spite of the fact he's making a hat and won't be able to wear it for at least 5 months (seriously, this summer can not end soon enough). See the furrowed brow? Serious concentration is happening here. He's got his pattern right there and he said this is the first project without a flub in it (knock on wood) so his practice is paying off (I think he did fine on my hat but I don't think I'd notice if he hadn't). It won't look anything like the hat he made last Christmas for my brother-in-law Dave. I forgot to share this one earlier, but Dave was very happy to have a new hunting hat and Joey chuckled the whole time he was making it. Joey found the pattern on Ravelry where is he a member of SMACK (Straight Men Also Crochet and Knit). He's awesome that way. It's a new week!! Make it wonderful (you can start by sewing something....I think I will)!